Private Parties: Whether you are planning a birthday party, girls night in, bachelorette party, baby shower, or religious celebration, a Mehndi Moments private party can be affordable whether you pay for the whole event or split the cost among friends! Parties are $100 an hour. Individual Appointments: If you want to try out a tattoo design, desire a day of indulgence, or wish to provide a gift to someone special, individual appointments are the perfect venue! You can share your individual appointment with one friend depending on the designs you choose! Individual appointments start at $80 an hour. Prenatal and Blessing Way Henna: Receiving henna during pregnancy is an ancient practice. It was believed to help bring about an easy birth and healthy child. I’ll work with you to create a custom design full of meaning and symbolism. Prenatal henna generally costs $90. Henna Crowns: For clients with Alopecia, or who’ve lost hair or breasts due to cancer, I have a flat rate of $80. Whether you want henna to adorn your head or your chest, I would be happy to help create a custom design that empowers you. Bridal Mehndi includes a free 30 minute consultation and small trial henna. Please book your consultation appointment AT LEAST a month in advance of your wedding to ensure artist availabilty and so your trial henna has time to wear off before your bridal henna appointment! Pricing for the bride, bridal party, and guests is determined at the consultation depending on your needs. Pricing for the bride depends on the intricacy and size of the design chosen. Most brides spend between $200-$400 for bridal henna, not including the cost of the bridal party. Bridal henna is best applied 3 days before your special day so the stain has time to develop. Keep this in mind when scheduling your bridal henna appointment. Fundraiser: Occassionally I am available for fundraisers, either donating all or part of my services. Festivals, Schools, Church or Corporate Events: Mehndi Moments can provide fantastic and fast henna at large events, providing one (myself) or many henna artists depending on your needs. I provide my own henna tent for outdoor events, or can bring the smaller indoor set up. The artists I bring with me are used to handling large crowds, and each artist can provide 15-20 small to meduim designs an hour! 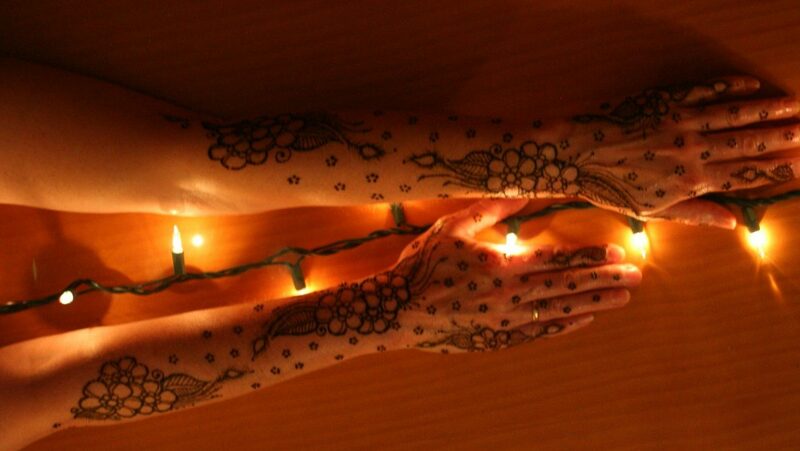 Workshops: Currently Mehndi Moments offers three educational workshops. Call to request descriptions and pricing. Gift certificates are a unique and fun way to pamper someone special. These are great to give as birthday, holiday, baby shower, or anniversary gifts! Certificates are available for 60 and 90 minute sessions. Desination Henna Events: To have a Mehndi Moment in any other state or country I merely require that you cover my service price, airfare, and basic lodging and rental car/cab fare. There are no hidden fees. My passport is current. Copyright © 2011 - 2017 Mehndi Moments. All images/pictures may not be used without the explicit permission of Amy J. Leinen.